At Geelong Galvanizing, we hot dip galvanize steel components for superior corrosion resistance and durability in wet or dry applications. As innovators in high quality, corrosion resistant steel finishes, Geelong Galvanizing is the only Galvanizer in Victoria to offer painted steel finishes. We also specialise in applying Duplex coatings; a paint finish over galvanized steel, for the ultimate in performance and aesthetics. We also manufacture TetraWal building products and retaining wall solutions for residential jobs and large scale land development projects. For over 25 years Geelong Galvanizing has specialised in providing high quality surface finishes for steel products in the construction, landscaping and engineering industries. We galvanize steel components for superior corrosion resistance and durability in wet or dry applications. Our painted steel finishes provide a strong aesthetic in your choice of colour and the innovative Duplex coating system applies paint to galvanized steel for the ultimate in low maintenance, long-life performance. 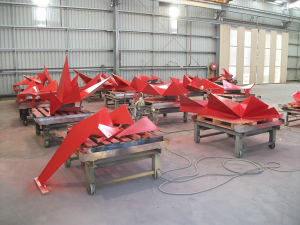 Geelong Galvanizing fabricates customised steel components for a range of applications, including mining and infrastructure projects. We also manufacture TetraWal retaining wall solutions for residential jobs and large scale land development projects. Our modern manufacturing facilities are based in Geelong, Victoria and incorporate solar panels, wind turbines and recycling systems to deliver sustainable product choices. 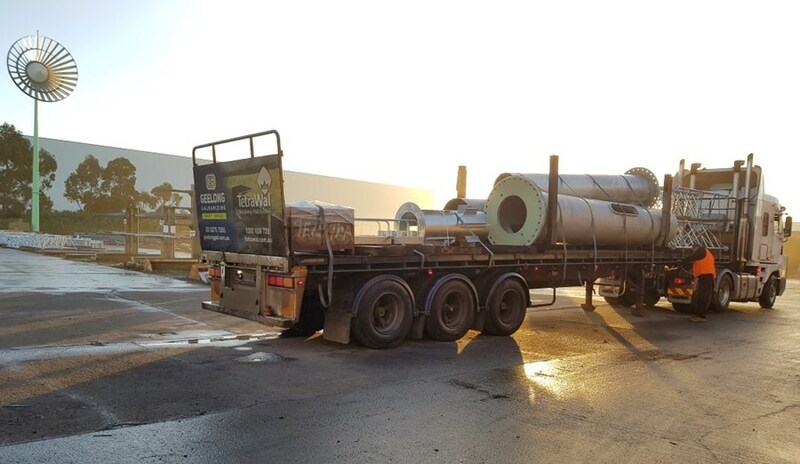 Our team offers free technical advice and our in-house transport fleet picks up steel components and delivers the finished product to your site. 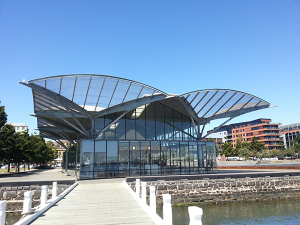 Geelong Galvanizing are innovators in developing high quality, corrosion resistant, steel finishes. Our Geelong manufacturing facility Hot Dip Galvanizes all steel components to AS/NZS 4680. Galvanizing’s protective zinc/iron surface alloy maximises the durability and corrosion resistance of steel. Galvanizing also offers economic efficiencies with a low initial cost, minimal maintenance requirements and low lifetime cost. As innovators in high quality, corrosion resistant steel finishes, Geelong Galvanizing is the only Galvanizer in Victoria to offer painted steel finishes. We also specialise in applying Duplex coatings; a paint finish over galvanized steel, for the ultimate in performance and aesthetics. Our purpose built abrasive blasting and painting facilities create a controlled environment for preparation and application to ensure a striking paint finish. 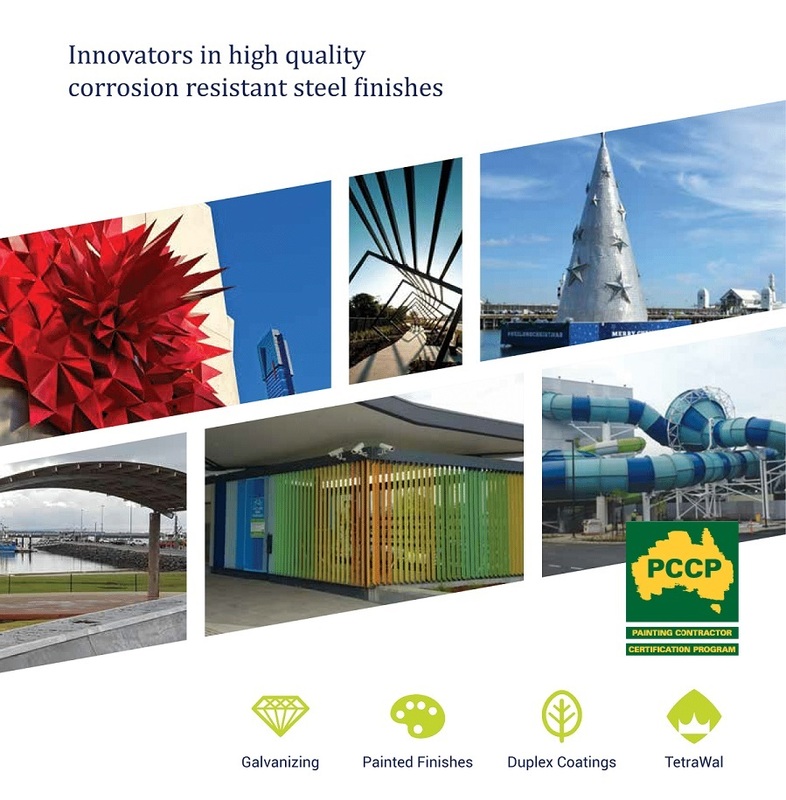 Geelong Galvanizing is PCCP certified for the application of paint coating systems; providing high quality finishes that offer long-term paint performance. We custom manufacture a wide range of steel components to your specifications. These may include stanchions or grated walkways for the mining industry, along with components or cleats for infrastructure projects. Our highly experienced team provide technical advice to optimise the design and fabrication of your project. 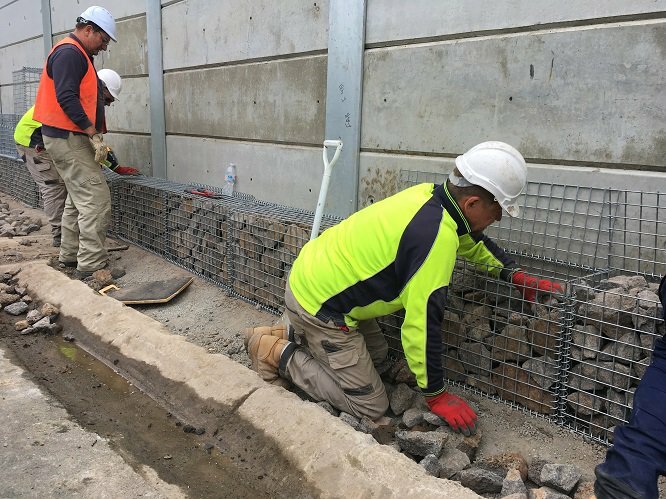 The TetraWal range of retaining wall solutions include hot dip galvanized steel posts and joining systems. These are available in set sizes for DIY installations or may be custom manufactured to suit the load requirements of any residential or civil infrastructure project. TetraWal is designed to work with a wide range of retaining wall materials, from sleepers to stacked stone options. Geelong Galvanizing fabricates customised steel components for a range of applications, including mining and infrastructure projects. We also manufacture TetraWal retaining wall solutions residential jobs and large scale land development projects. Hot Dip Galvanized Steel is a proven performer as a durable, low maintenance, sustainable product. Corrosion protection is enhanced when the design, fabrication, steel composition, surface preparation and galvanizing process are optimised to work together. Galvanizing also offers economic efficiencies with a low initial cost, minimal maintenance requirements and low lifetime cost. As a local Geelong manufacturer and employer, we are committed to Future Proofing Geelong and are an active member of Sustainability Victoria. Duplex coatings offer the ultimate in aesthetic finishes – low maintenance, durable, corrosion resistant and available in any colour! We custom manufacture a wide range of steel components to your specifications and galvanize them for long life corrosion protection. These fabricated products may be stanchions or grated walkways for the mining industry, pier fittings, truck chassis components or cleats for infrastructure projects. All TetraWal components are hot dip galvanized to AS/NZS4680 and are backed by a 5-year strength and corrosion warranty. Our engineering team offers free technical advice to optimise the long-term performance of your design.